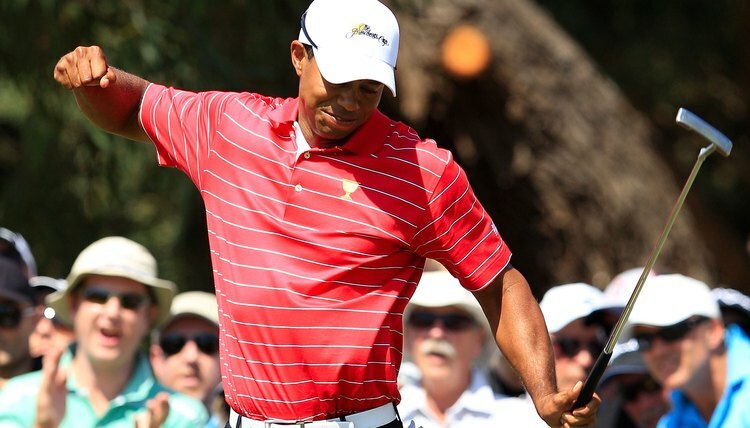 Tiger Woods is known for his tremendous confidence. The mental aspect of golf is possibly the most important part of the game. Players of equal physical ability will often achieve different results due to how they approach the game mentally. For beginners it is important to have a proper mental outlook toward the sport, so knowing a few tips on how to attain a positive attitude and maintain it during a round will help. A golfer can try to see her shot before she strikes the golf ball, envisioning in her mind its trajectory and landing point. She can do this prior to hitting the ball, whether it is off the tee, an approach shot to a green, a putt toward the hole, or a wedge shot from close by to the green. After having seen the shot in her mind she can step up to her ball and attempt to execute the shot. However, if the results fall short of what she had in mind she should not dwell on the problem. Rather, she should simply repeat the procedure for the next shot. When faced with a question of attempting a difficult shot such as a long carry of the ball over water a golfer needs to be strong enough mentally to be honest with himself. He needs to be able to make a judgment on what he has to gain and what he has to lose and then weigh that against past performance in such situations. During a round, especially a good round, it can be very easy to “go for broke.” but a golfer needs to know that winding up broke in such a scenario means adding a few strokes to the hole if the shot fails. A golfer with the right mental approach in these scenarios will put aside his ego and decide on the best course of action based on information processed from what he has accomplished during other outings and not from what he hopes he might be able to pull off. Anger management is a huge part of the mental golf game and allows a player to be able to recover after hitting a bad shot. The golfer that hits a ball out of bounds, into the sand, or misses a doable putt has every right to be angry with himself. However, this emotion can carry over into the remainder of his round and result in a loss of concentration and snowball, leading to continued bad play. After reacting angrily to a poor shot a golfer should use whatever means he can to calm down. In some cases this could mean taking deep breaths, while other golfers may find that focusing on the scenery of the golf course and the exercise she is getting to relax. Once the golfer’s head is clear the next shot can be approached with a fresh outlook. What is a Good Golf Score for a Beginner?